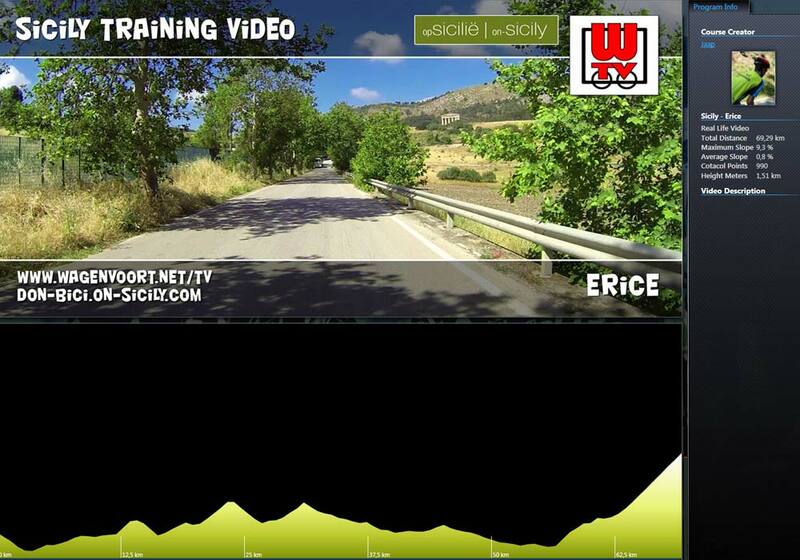 The hilly and mountainous landscape in Sicily is ideal for cyclists! From the coastal towns of Balestrate, Castellammare del Golfo, Alcamo Marina and Trappeto you can make several beautiful bike trips in the area. Due to the lovely Sicilian weather you can ride a bike for most part of the year, roughly from March until (the end of) December. On this page you’ll find cycling tips and information about bike rental, cycling with an English speaking guide and real life videos for your Tacx trainer. Click here to go to page with bike routes. Whether you’d like to conquer the hills and mountain climbs in the area by mountain bike, road bike or hybrid bike, we can arrange the bicycle rental for you. 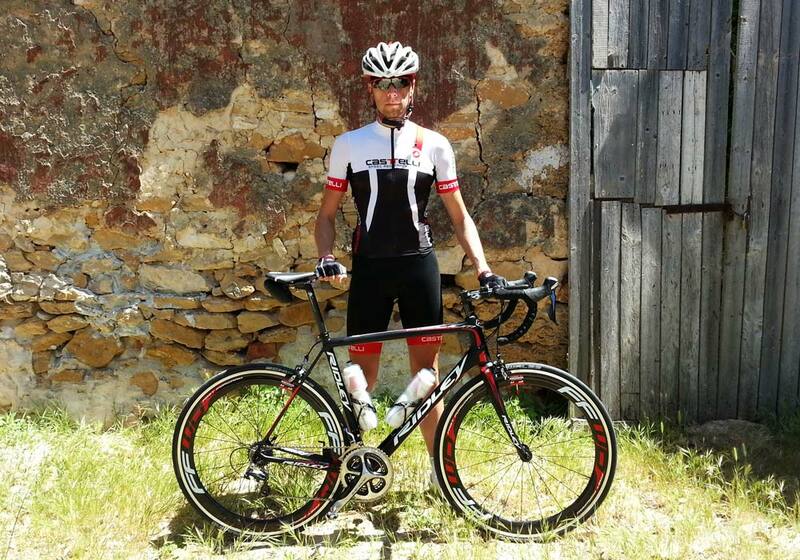 We organize bike rental in collaboration with our friends at Eurobici in the town of Partinico and offer several quality road bikes and MTBs, such as carbon Ridley and Focus road bikes and Focus and Ghost mountain bikes. To ensure that your rental bike fits you perfectly and rides as comfortably and efficiently as possible, we’ll do a quick bike fit when you come and pick up the bike. 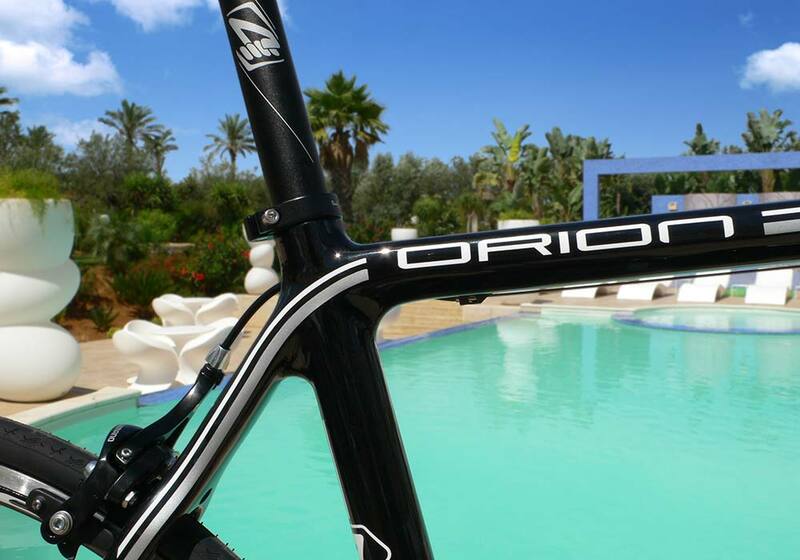 On this page you’ll find the rates and several pictures of our Ridley road bikes. If you’d like to go cycling with someone who knows the area well, we can arrange a local (and English speaking) cycling guide for you. Based on your wishes, he will plan an itinerary with you (minimum 50 and maximum 150 km, maximum 2000 meters elevation). Depending on the route, the guide will be waiting for you at Eurobici in Partinico or at the Eni gas station in the town of Balestrate. Click here for some examples of cycling routes you can follow with a guide. If you cycle with a cycling guide, you can test a Polar bottle and a Castelli vest for free. The costs for a road bike ride with a cycling guide are 25 Euros per hour, with a minimum of 75 Euros. In collaboration with Sikania MTB from Palermo we organize mountain bike rides with English speaking guides. You can do beautiful rides in the gulf area but also in the mountains near the city of Palermo, like Monte Pellegrino, from which you’ll have a lovely view of the sea and the city! The costs for these rides depend on the time spent on the bike: the guides calculate 35 Euros for one person for a less than three hour ride or 50 Euros for two or more people. For rides longer than three hours the additional costs are 10 Euros per hour. If you won’t be able to bring your own mountain bike to Sicily, you can rent one in Sicily. See bike rental. 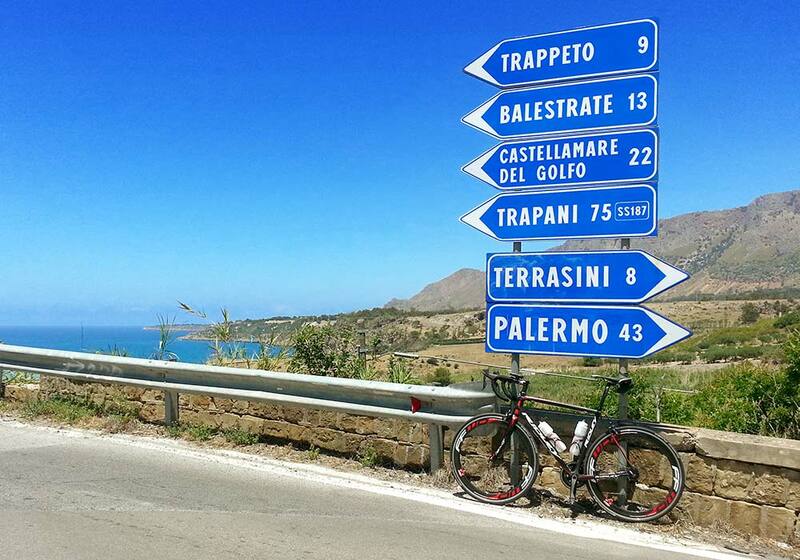 Haven’t you been to Sicily yet, but you’d already like to cycle here? No problem! In june 2013 we made several Real Life Videos with Jaap Wagenvoort which are compatible with your . A lovely ride to the medieval town of Erice, 750 meters above sea level, passing the archaeological park of Segesta and the Garibaldi monument at Pianto Romano. Watch the trailer and order this sunny RLV here! With a total length of 18.6 kilometers, this is the shortest RLV of the three. 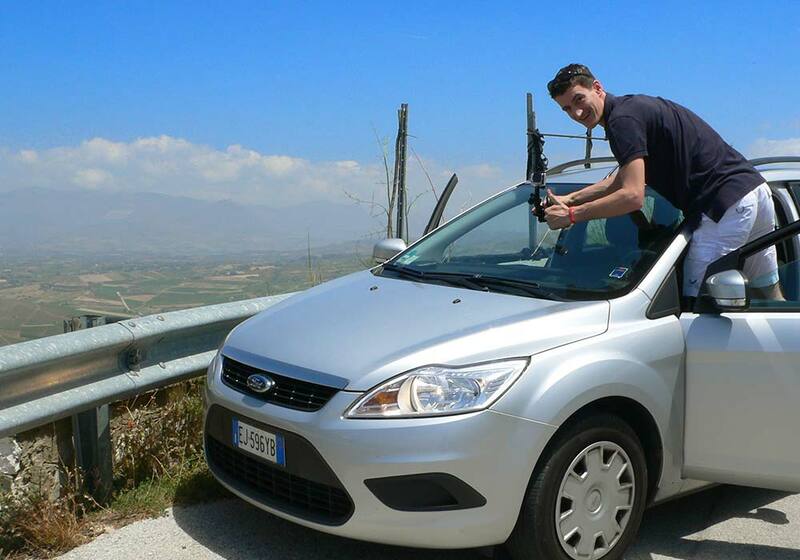 Ride from the valley to the town of Alcamo on Monte Bonifato. From this town you’ll climb to the Bosco d’Alcamo, 739 meters above sea level. Follow cycling guide Don Bici and ride from the coastal town of Balestrate in the direction of Terrasini. After this warming up, you take over and ride towards the town of Carini where you’ll start the Carini climb (around 450 meters ascent). 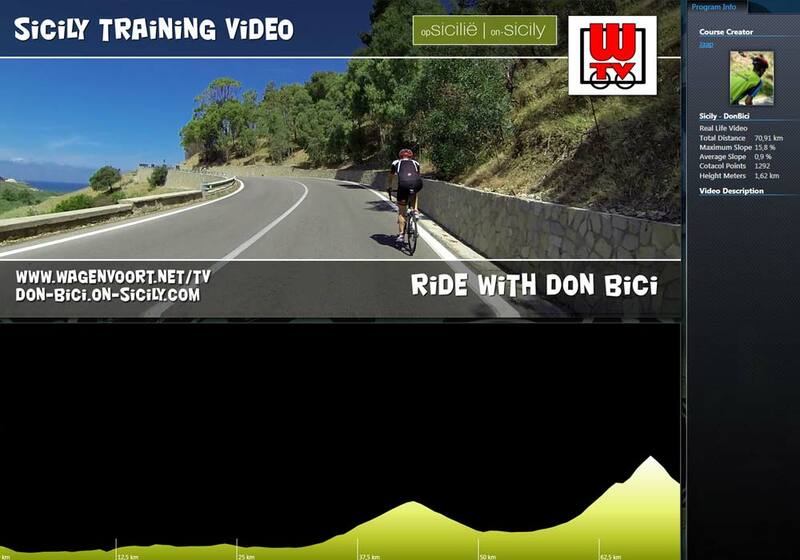 Halfway on the climb Don Bici will join you and you can follow him on the descent through the town of Montelepre towards the town of Partinico. Then it’s time for the challenging final climb, which will take you up all the way to the radio antenna at the top of Via Romitello, 1.000 vertical meters ascent, the final 3 km averaging at 10%! It will be hard, but the scenery will certainly make up for it! In bocca al lupo! Riding your bike in Sicily means riding in hot, sunny weather for most part of the year. 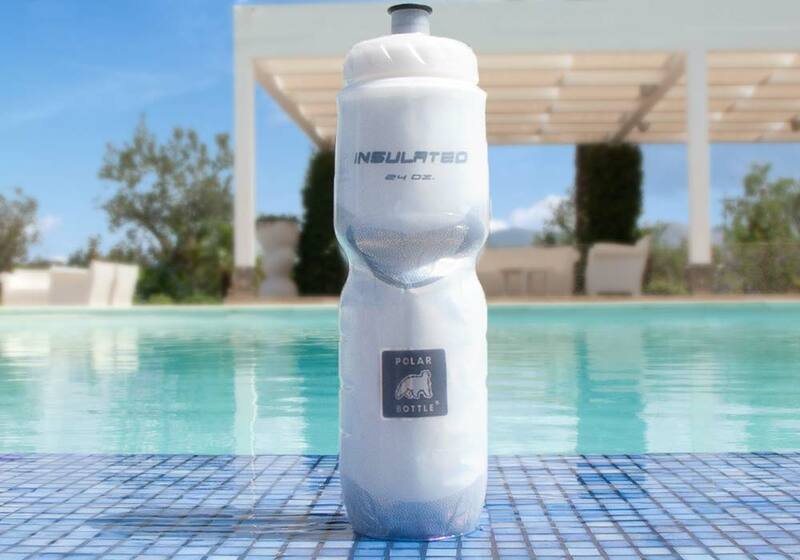 With these high temperatures, the water in your water bottles will be lukewarm in no time, but with a Polar Bottle you can keep your water cool for 3 to 4 hours! Fill your Polar Bottle up to about 80% and put it in the freezer the night before you go on a bike ride. If the bike route is less than 50 kilometers, then you should take the bottle out of the freezer one hour before you leave, otherwise you can leave the Polar Bottle in the freezer until the moment you start your ride in the Sicilian hills and mountains. If you go on a bike ride with one of our local guides, you can test a Polar Bottle for free and you’ll see why we love Polar bottles! There are no bike lanes in Sicily, but the Sicilians are used to seeing cyclists on the road. However, avoid riding too close to the side of the road. Instead, own your space and make sure the other road users can easily see you (in time). Always wear a helmet (this needs no further explanation). If you’re planning on riding on your own, take a (plasticized) card with your name and contact details with you. You can also mention our names and phone numbers on the card. 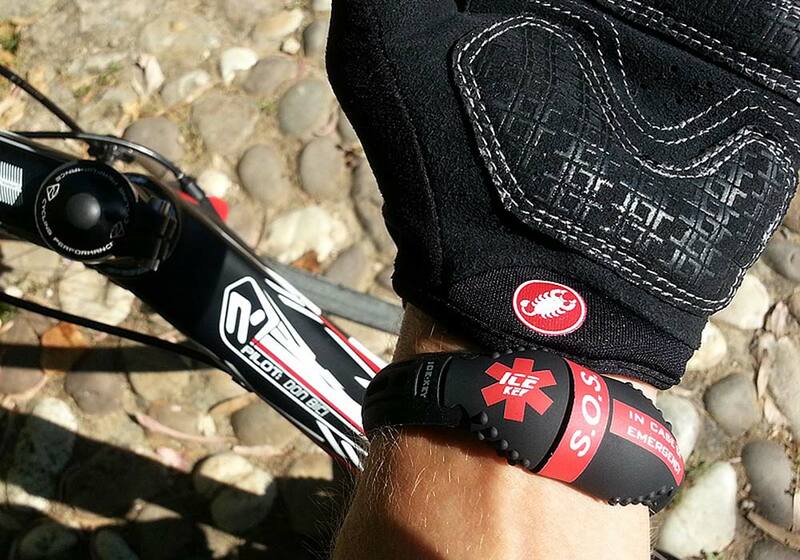 Also let your travelling companions know which route you’d like to ride. There are several routes to choose from: see bike routes. In the months between October and March it’s getting dark early in the evening, so if you go for a ride in the afternoon, make sure you wear reflective cycling clothes and mount some lights on your bike. If you’d like to go for a ride in the summer, make sure you wear cycling clothes made from airy and breathable materials and wear a bandana under your helmet to keep your head cool. In the months of April – May and September – November we advise you to bring a wind vest with you. Such a lightweight vest will fit easily in one of your jersey pockets and will keep you warm on the descents. 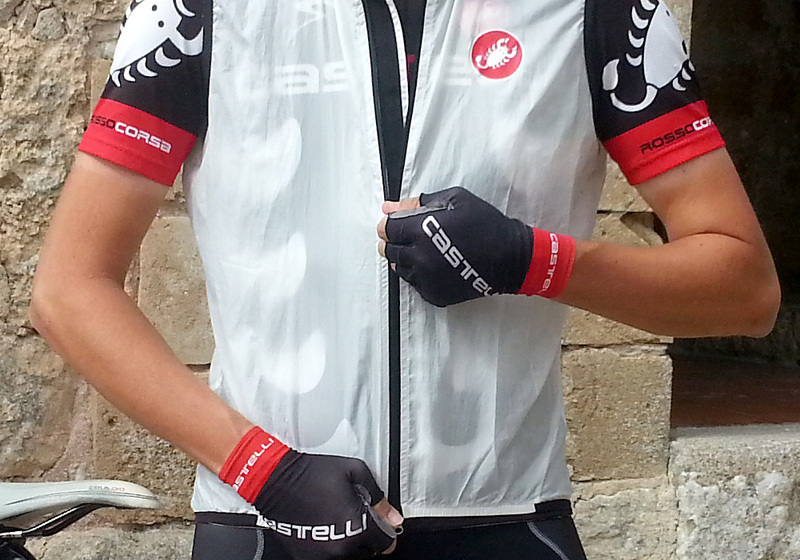 If you go on a bike ride with one of our local guides, you can test a Castelli Cycling leggero vest/jacket for free. In the other months you can encounter cold(er) winds and the chance of rain will increase. So if you’re riding your bike in this period, make sure you bring a long sleeved jersey and or a cycling / rain jacket. TIP: With our onsicilycard you’ll get a 15% discount on cycling clothes (and other bike related items) in bikeshop Eurobici in the town of Partinico. It’ll always come in handy to know how to do some basic bike repairs and bike maintenance. Check out MadeGood, the web’s most extensive guide to bicycle repair. 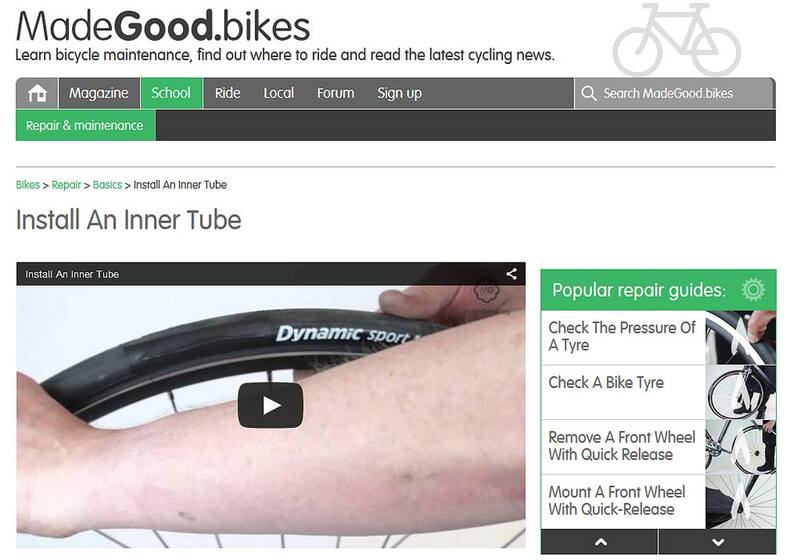 This MadeGood website offers lots of instructional videos about fixing and maintaining your bike. Underneath each video you’ll find a handy factsheet and a step by step instruction accompanied by detailed pictures. Simple, effective and free to use! 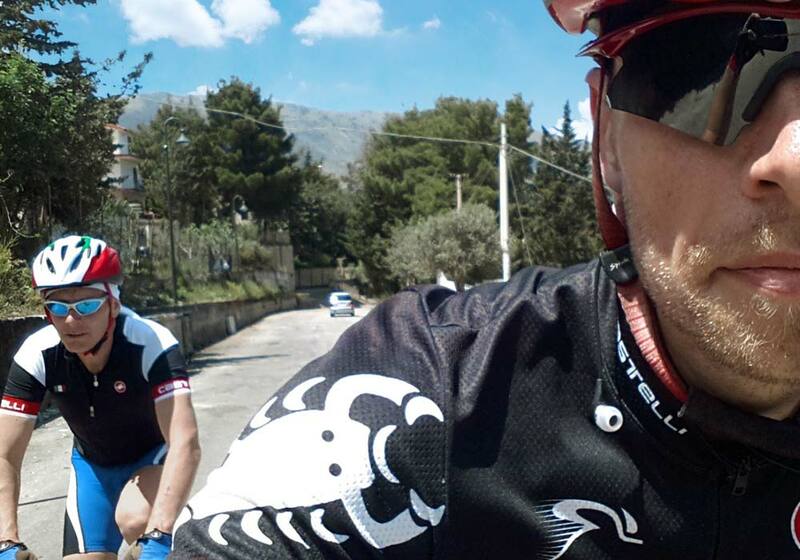 So what if you’d love to do some bike rides in Sicily, but you prefer to ride your own bike? No problem! Many airlines offer the possibility to transport a bike. Make sure your road bike is well protected though, so it will arrive safe and sound on this lovely island. Scicon offers both hard cases and bike bags for cyclists who wish to protect their precious bike during travel. Watch these videos and see how you can pack your bike in a Scicon hard case or bike bag and how these bags and cases will protect your bike. On Don Bici’s cycling blog you’ll find lots of pictures of the area, tips and several bike routes, also for mountain bikes.